Pearl and Seigen celebrated their wedding in Iowa before returning home as a married couple to Tokyo, Japan! They were married before a small group of family and friends at the Cedar Falls Woman’s Club. Originally, they booked me to provide music for the ceremony only. 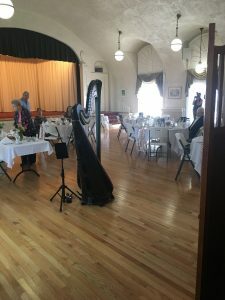 After visiting the venue in person, they realized they couldn’t waste the beautiful acoustics of the reception space, and added background harp music for dinner, too! The maid of honor’s and the bride’s processional were both J.S. Bach pieces – “Sheep May Safely Graze” and “Prelude in C,” respectively. The song for the unity wine ceremony was “Arioso,” also by Bach. Clearly, they love Baroque music! The recessional was the traditional “Wedding March” by Mendelssohn. During the reception, I played a variety of jazz standards, pop pieces, and classical music, including “Great Day,” “Winter” from The Four Seasons, and “Hymne” by Vangelis. 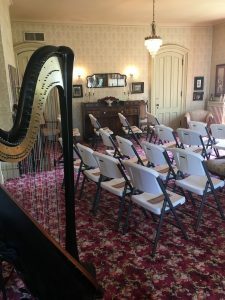 I play the harp for weddings in Waterloo, Cedar Falls, and throughout Iowa. Contact me about having a harpist for your wedding ceremony, reception, or both! 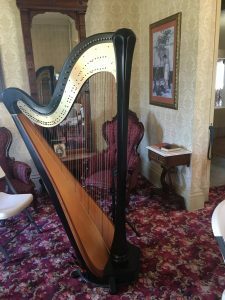 Visit my website – Waterloo Iowa Harpist – for details. 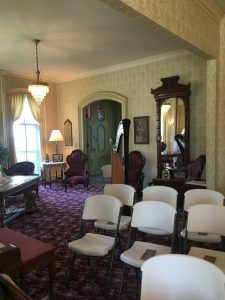 This entry was posted in Indoor Wedding Ceremonies, Wedding Receptions, Weddings and tagged cedar falls, cedar falls womans club, ceremony, iowa, penti, reception, waterloo, wedding. Bookmark the permalink.